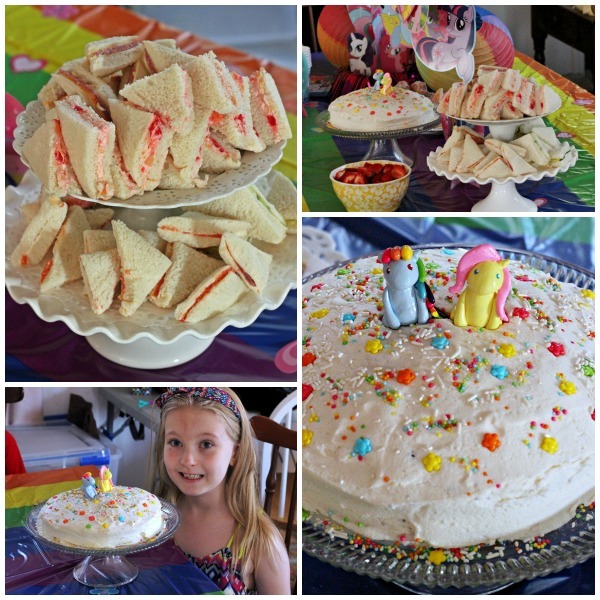 We recently had a special 7th birthday party for Violet. She requested a rainbow dash tea party. I am starting to get to the point of just having smaller scale birthday parties. It was myself, the kids and their grandparents. Does anyone else do smaller birthday parties? Having tons of kids over and having to provide food, activities and party favors for all those people is more stress than I really want to deal with. I liked the smaller party and I think we'll continue that going forward. I managed to get a few quick pictures but I forgot to photograph a few of the food dishes. Since we are really busy each Friday I made most of the food the day before with the exception of the tea sandwiches since those are best fresh. I tried to have a balance of food that both adults and kids would like to eat. Not pictured are the big mylar balloons I got off Amazon. If you buy a helium tank at Walmart you can get nice balloons on Amazon for much cheaper than what they would charge you at the grocery market. Probably the cutest part of the theme were the handmade My Little Pony figurines. I had a custom order done from Natalie at IcyPanther on Etsy. She made a huge collection of figurines. We loved all of them. They are beyond adorable and very detailed for such a low price. Highly recommended if you are a MLP fan, or know someone that is. Tea sandwiches: Cucumber sandwiches on buttered bread. Cherry and Pineapple Tea Sandwiches. Smoked salmon with cream cheese. Salami and cheese on buttered bread. Pastel Tie Dye Layer Cake with vanilla frosting. We used a mix that she had REALLY wanted to try for her birthday. It makes a very short cake with thin layers. The picture on the box is very misleading as it shows thick cake layers. The colors were great, but I would suggest buying 2-3 mixes to make a thicker, most substantial cake. What a wonderful spread, very colourful and tasty looking. I hope Violet enjoyed her party. My daughter has also just invited her sons' grandparents (us, as her husbands parents died) and her Uncle and his wife, she decided after Connors7th party she would just have family and he has not complained. Thank you for great ideas for his next birthday.